I've had serious difficulties in setting up point forwarding for my router, a RAC2V1K. I'm able to set up most of the prompts without difficulty, save for one: Public IP. Whenever i attempt to, the prompt is always greyed out and hitting the refresh button does nothing. Because of this i havent been able to have the port be detected by outside sites. Is there anything i can do? Are you using one of Soectrum’s all-in-one modems and paying them for home WiFi? If so, they control a lot of what goes on inside the router. To that end, you may be able to do what you want IF you use your own router along with a standalone modem. Be advised that running a server on Spectrum residential internet probably violates the Terms of Service. No,, it was a router included with a seperate modem, included for free when i signed up for service. The key statement is that Spectrum gave it to you. Therefore, there are settings that they will disable, since they can control it remotely. Doesn’t matter if you are paying to rent it or not. Buy your own router to keep the cable company out of your LAN. Maybe the router is being smart enough to know that the pulic IP is the one assigned to the WAN port, because that's the only one that would make sense, and so not giving you the opportunity to screw it up. As it's a stand-alone router, I'm not sure how Spectrum could control it behind the modem, unless they've loaded their own crippled version of the firmware. In which case, just upload the manufacturer's version. As far as I can tell it is impossible to set the public ip. For instance I tried to setup a ddns which it lets me do. The router automatically updates the ip for my service. 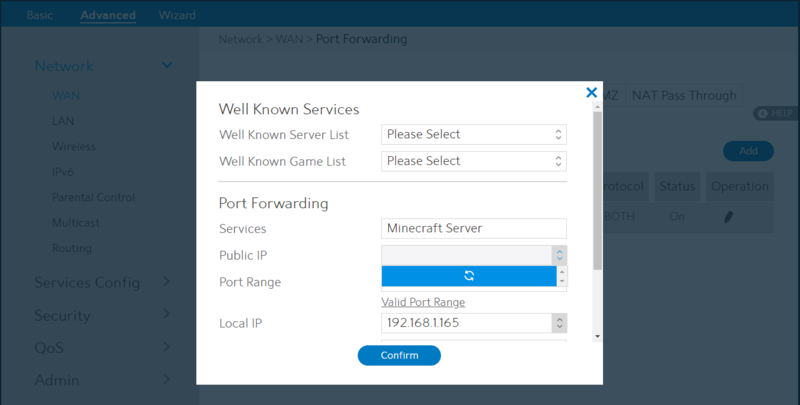 But none of my port forwards do anything, and I suspect it is because the public IP cannot be set. I enabled the text box by meddling with its source but I could only use characters in ipv6 I think so it wasn't suited to a ddns address. 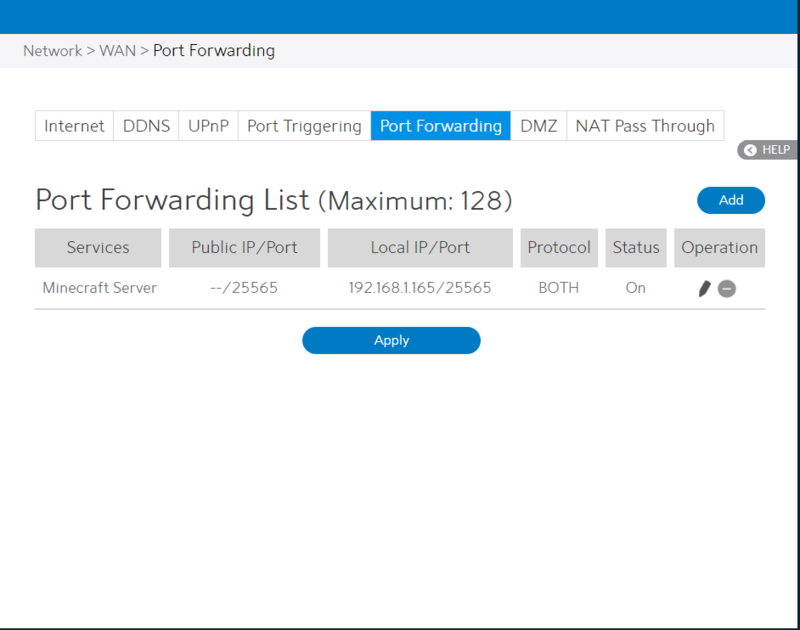 This is the first time I ever tried to set up port forwarding so I could be missing something, but when i go to my example.ddns.com:8080 or whatever its not open/the browser refuses it (I know I was pointing it at a working page on my network). When I run nmap on my ddns I find that the port I tried to open isn't open. My next step will be to try to put my old linksys router as the router connected to the modem and try it that way. As of now my ddns is kinda useless though as it will only access my router which serves no purpose, at least unless I use the routers usb possibilities. The ftp works on the router, but it seems rather limited. At least I can't use sftp and there seems to be some problems using ftp via php or linux command line, whereas it works via filezilla and curl. I'm ready to try swapping out the router because it seems to not function how I was hoping. I could plug along with the php for anothr couple days and not figure it out. I couldn't even begin to guess why curl and filezilla (and ftp://example.net in the browser) work but php fails to connect as well as ftp on the command line. Burned enough time already, if anyone has any ideas maybe I'll check back sometime.